A beloved Disney classic washed ashore at the Durham Performing Arts Center Tuesday night as the Broadway adaptation of “The Little Mermaid” debuted and transported the audience to a whole new world. Based on the story by Danish author Hans Christian Andersen, the coming of age story tells the tale of mermaid Ariel who longs to leave the sea kingdom below ruled by her father King Triton and explore the land of man up above. Upon meeting and falling in love with the mortal Prince Eric, she makes a Faustian deal with the sea witch Ursula so that they can be together. The live production mirrors the style of the Disney film and invokes a sense of nostalgia in those who grew up with it. However, the emotions of young love and parents protecting their children is relateable to anyone who may have not seen it before. Cast of Disney's THE LITTLE MERMAID. Photo by Mark & Tracy Photography. Delicious and vicious Ursula, in true Disney villain fashion, is condescending and overly dramatic, yet steals the spotlight whenever she’s featured. Sebastian the crab provides the comedic timing that instantly elicits laughter. Classics such as “Under the Sea” and “Part of Your World” were brought to life as the crowd sung along in conjunction. Ursula’s signature song “Poor Unfortunate Souls” is my favorite Disney tune, with various covers over the years modernizing the deal making track (special shout-out to the Jonas Brothers’ pop-rock version from the 2006 soundtrack re-release). The costumes are spectacular, the creativity that went into creating them of awe inspiring fare. The set design is equally as beautiful and stimulates the audience’s imagination to fill in the blanks. No matter the age, this stage was for everyone. A fantastic show that doesn’t miss in delivering smiles to faces. 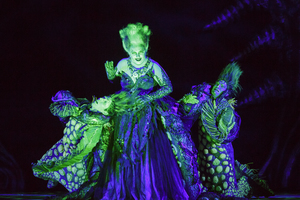 “THE LITTLE MERMAID" is produced by Pittsburgh CLO & Kansas City Starlight. It runs on stage at the Durham Performing Arts Center now through Sunday, October 22, 2017. Find tickets online at DPACnc.com, Ticketmaster.com or at The Blue Cross and Blue Shield of North Carolina Ticket Center at DPAC, in person or by phone at 919.680.2787.